Cutting edge length: 2.60 in. 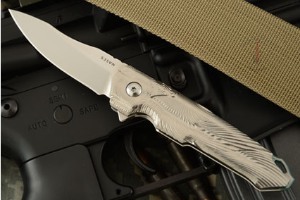 Description: This custom Metis folder is a one-off design from Spartan Knives. The titanium handle has been laser engraved with a custom design that sets itself apart from the classic production Metis folder. 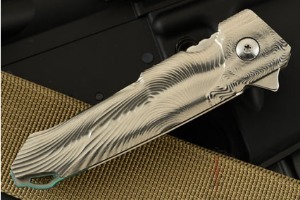 It also features some additional anodizing to add additional flare if the engraving wasn't enough. The Metis folder is named for the Titaness of wisdom and deep thought. She was the embodiment of "prudence and wisdom". In Greek, Metis means the personal traits of wisdom and cunning. This small size folder is a very comfortable everyday carry. 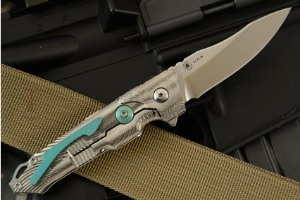 The sleek blade and fast opening from the flipper tab makes for a great looking and a very functional tool. The blade is made of American-made Crucible CPM-S35VN stainless steel with a slight scallop on top to allow for index finger control on blade spine. The high end steel and an exceptional heat treatment ensure optimal edge holding and durability. It features a polished, stonewash finish. The blade rotates on GTC Alpha bearings for smooth and reliable action. The 6AL-4V titanium frame offers a sturdy frame lock with a Rick Hinderer designed lockbar stabilizer to prevent the lock bar from over traveling. The backbar offers a lanyard carry option. 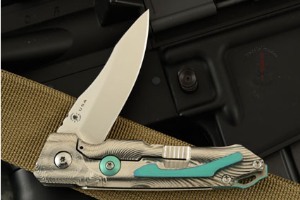 The pocket clip, lockbar stabilizer, and back bar have all been anodized green for accent. 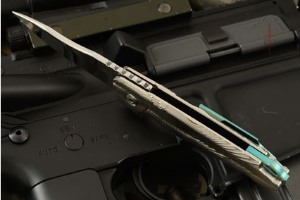 The hidden hardware pocket clip is mounted for right-handed, tip-up carry. 0.203125 0.0625 203.125 62.5 Trailer Started.